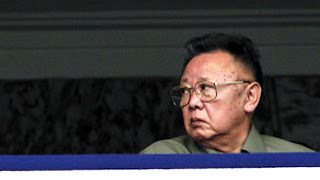 Kim Jong-il, leader of North Korea, has passed away after 17 years in power. Kim is reported to have died of a heart attack on Saturday although his passing was only announced early Monday morning. He is succeeded by his son Kim Jong-Un, though commentators are cautious of any political change in the country. As citizens across the country were seen showing outpourings of grief [Xinhua], further afield there was concern over the future of the dictatorship. In South Korea stocks tumbled at the news [Xinhua] and there were heightened concerns after its northerly neighbour test-fired a missile [Sky News]. Asian stocks were particularly hard hit. The Seoul Kopsi saw a 3.5% fall, while the Nikkei fell 1.26% and the Hong Kong Hang Seng dropped 1.18%. The Shanghai Composite also dropped, but by only around 0.3%. Across other markets in the west there was less impact however. There were few commiserations coming from nations around the world as often seen following the death of other world leaders. Reactions from the international community to the death of North Korean leader Kim Jong-il were somewhat muted. China was one of few countries offering its condolences to the 69 year old dictator. As the national flag over the North Korean embassy in Beijing flew at half mast, China's Ministry of Foreign Affairs, Ma Zhaoxue, praised Kim's leadership for developing North Korea's "socialist cause". "We are shocked to learn that the top leader of the Democratic People's Republic of Korea [DPRK], comrade Kim Jong-il, has passed away. He was a great leader of the people of the DPRK and a close and intimate friend of Chinese people." Other world leaders were not so forthcoming with sympathy. Kevin Rudd, Australia's Foreign Minister, said that Kim's death presented "an important opportunity to the new North Korean leadership to engage fully with the international community, on how to improve their economy in order to properly feed their people and critically on how to deal with the outstanding problem of North Korea's nuclear weapons program." However many have been cautious as regards any possible change in the region. French Foreign Minister Alain Juppe said was wasn't "much hope" given North Korea was "a completely closed off regime." "We are very cautious about the consequences of this succession. We hope that one day the North Korean people will find freedom. There are ongoing talks with North Korea ... and we need to keep on talking with China and other participants to make North Korea abandon its nuclear weapon." While Britain's Foreign Secretary William Hague said he understood Kim's death would be difficult for the people of North Korea he said he hoped that the change of administration might bring about change. "This could be a turning point for North Korea. We hope that their new leadership will recognize that engagement with the international community offers the best prospect of improving the lives of ordinary North Korean people." "We encourage North Korea to work for peace and security in the region and take the steps necessary to allow the resumption of the Six Party Talks on de-nuclearisation of the Korean Peninsula." Some news reports pulled fewer punches when describing the former leader. CNN's John Vause described Kim Jong-il as "every bit the nutty tyrant" with his over-sized glasses and trade-mark jumpsuit. BBC's John Simpson referred to him as "weird" and "distinctly odd". An avid movie buff, James Bond films were said to be amongst the leader's favourite, though he was often unhappy over he and his country's portrayal on the big screen. Kim was famously depicted in the puppet film Team America World Police as a mastermind behind a violent terrorist plot. And with particularly comic satire the 'dear leader' was shown singing "I'm So Ronery" ["I'm so lonely"], a pointed comment on North Korea's isolation [YouTube]. Nutty or weird, Kim Jong-il also posed a serious threat to the region. South Korea was attacked several times over the past few years, the most provocative of which occurred last year when North Korean forces bombed Yeonpyeong Island [tvnewswatch]. The demise of the North Korean leader was the top story across all the news stations, though some gave the story more dominance than others. CNN provided almost saturation coverage throughout the day. Coverage on Sky News and the BBC was also significant, though by midday both channels drifted back to domestic and other international news. While France 24, and Al Jazeera all led with the death of Kim Jong-il, reports were relatively short and soon gave way to other news. Press TV and Russia Today meanwhile focused on other issues. Press TV led with continuing turmoil in Egypt and across Bahrain, only briefly mentioning Kim's death. Russia Today began with a report on the sinking of a Russian oil rig with Kim's death dropping in as it's second item. Chinese television could hardly ignore the death of what it called a "close and intimate friend". CCTV News and CNC both headlined with the death of the North Korean leader with Xinhua's CNC providing greater coverage. While CCTV News ran with a 5 minute report, CNC broadcast a series or reports lasting some 15 minutes, hinging on North Korea's development since the Korean war. In North Korea itself propaganda also filled the airwaves. Following this morning's announcement of the death of the "Dear Leader" and scenes of uncontrollable grieving, state television broadcast patriotic music with images of mountains for much of the day. Bizarrely the North Korean official website was down, though the reason for the outage was not immediately clear. The Korean Central News Agency website was accessible although it had not been update for several days. As Kim Jong-Un takes the reins the country will remain in mourning for the next ten days. As for Kim Jong-Il, he is set to be buried on December 28th in what will likely be a lavish state funeral.